Welcome to Abyssinia Kitchen Coffee Ceremony and thank you for joining us. Before you witness our traditional Ethiopian coffee experience, let’s go back to where it all began the story of this flavoursome bean. Coffee was born in the heart of Ethiopia in 850, a herdsman named Kaldi observed his goat one day where he noticed that his goat was somewhat in a more chipper mood near a bush. Subsequently the goat chewed on the red berries and let out an exuberant ‘Baaaaaaaaahhh’. The coffee berry was discovered. Kaldi sampled the berries for himself and the feeling of elation consumed him. He declared to his goats “these berries are heaven sent” so excited he and the goat ran to the nearest monastery, telling of themiraculous effect. The chief monk was not amused “Are you possessed?” He condemned the berries as the Devils work and promptly threw them into the fire, “Evil!”. But soon after the smell of fresh roasted coffee filled the pious halls of the monastery, enticing the monks. After the chief monk dosed off, due to lack of caffeine mind you, a young rebellious monk snatched the cooling beans from the fire pit. This innovator, the world’s first barista, mixed the beans with water and the resulting brew kept the monks up all night, thanking their creator. “Hallelujah!” Quite a holy revelation, indeed. So there you have it quite the fairytale ending, to a long journey coffee has come to where it is now. 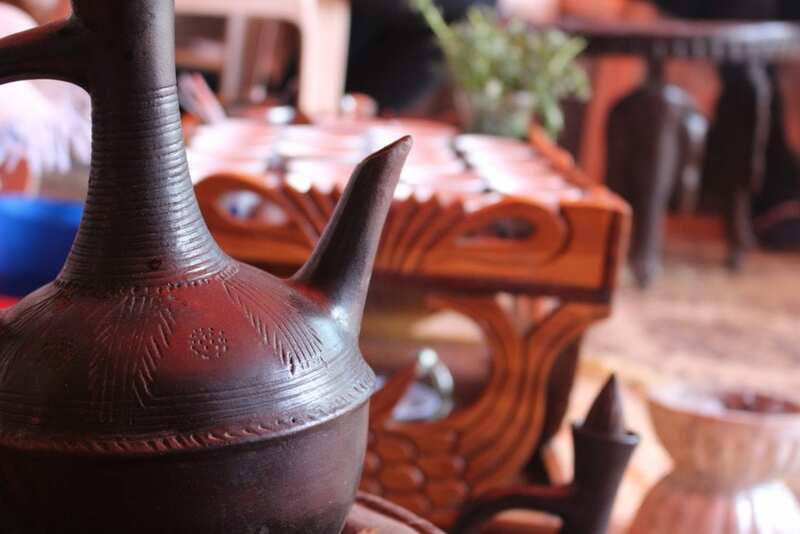 So gather round and be immersed in this occasion and embrace the culture and experience Ethiopia’s pride and joy at West Kirby Farmers Market 22nd July. Feel free to taste our coffee espresso shots at £1.00 each. 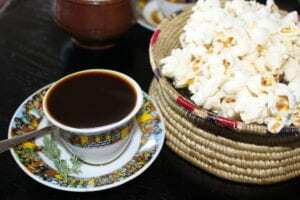 “An Ancient proverb best describes the place of coffee in Ethiopian life, “buna dabo naw” “Coffee is our bread”.